He describes himself as a shy person but that shouldn't be a problem to know him because his song speaks in volumes about his ability. 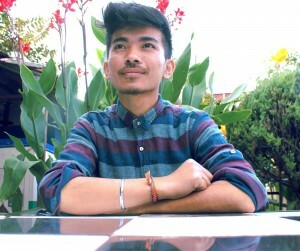 Jibesh Gurung is a young man from Pokhara whose singing aspirations have ushered him to Kathmandu. His formal musical lessons started in 2061 B.S. with guru Kaji Man Tamang in Pokhara itself. He draws influence from some of the greats in hindi bollywood music as well as nepali music. He has recently brought out his song entitled "Bideshi Bhumi" which is he says is about all those young souls who are either planning to go abroad or are already there. He puts it beautifully in words and in sound as well. Jibesh Gurung is the "Hot Shot" for the month of Mangshir (2073) in Radio Kantipur, Radio Rastrako.